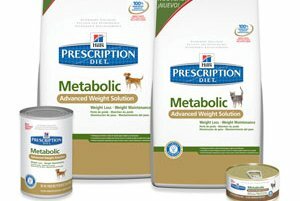 Hill’s Prescription Diet™ Metabolic Advanced Weight Solution is the first weight management food specifically designed to work the way your clients feed their pets. Traditionally, most successful weight management programs require strictly controlled conditions, either in laboratory settings or rigorously controlled weight management programs. Unfortunately, these strictly controlled conditions are difficult to duplicate in the ‘real world’. Hill’s is proud to offer a new solution for overweight pets that has been shown to work in the ‘real world’. In a landmark in-home study, over 300 overweight pets (159 dogs and 155 cats) completed a uniquely designed 2-month feeding study with Metabolic Advanced Weight Solution. Even without strict protocols and precise measuring, pets lost an average of 0.7 per cent of initial body weight per week. The majority of pet owners agreed that Hill’s Prescription Diet™ Metabolic Advanced Weight Solution was an easy way for their pet to lose weight, while keeping their pets feeling full and satisfied. Perhaps most impressive is that 80 per cent of pet owners said they would recommend Metabolic Advanced Weight Solution to a friend with an overweight pet. Hill’s Prescription Diet™ Metabolic Advanced Weight Solution is available in both a canned and dry form.